I never thought I would become this addicted to a Youtube feed, but I have, so I thought I'd better share the saga with you. 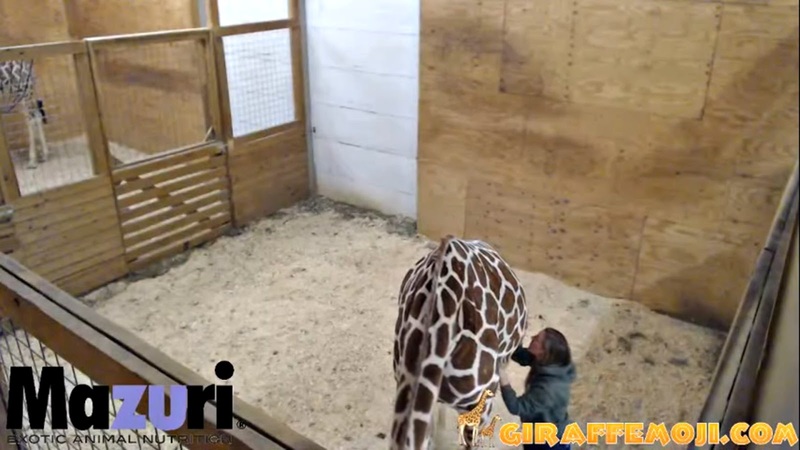 Normally it's all Minecraft and mayhem in our house, but, a few weeks ago, I caught wind of an interesting development over at Animal Adventure Park in New York, where a giraffe was soon to go into labour and produce a cute baby giraffe in front of the world via a 'giraffecam'! It doesn't get much more exciting than that, I thought, so I tuned in to watch. Two weeks and two days later (and I was late to the party!) we are all still waiting! It's #AprilWatch, folks! I think the confusion began, because some of the news outlets linked to the Youtube feed, by saying that April was in labour, which suggests a day or two at most to wait. However, having watched the feed for over two weeks (not constantly, I have been offering up a little 'cross your legs til morning, April' prayer, before retiring for the night!) I have learned a thing or two about giraffes. It turns out, that in the wild it isn't wise to let predators know that you are in labour, which makes sense, so giraffes will go to great lengths to hide the fact, until the baby begins to make an appearance. 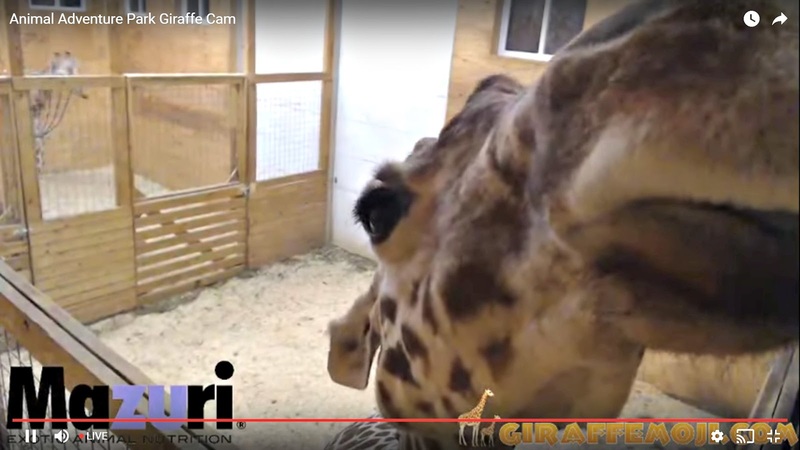 This instinct is so ingrained that even captive giraffes, like April, obey this unwritten rule. April was mated with her fella, Oliver, three times, seventeen days apart, so no one is entirely sure which mating actually 'took'. 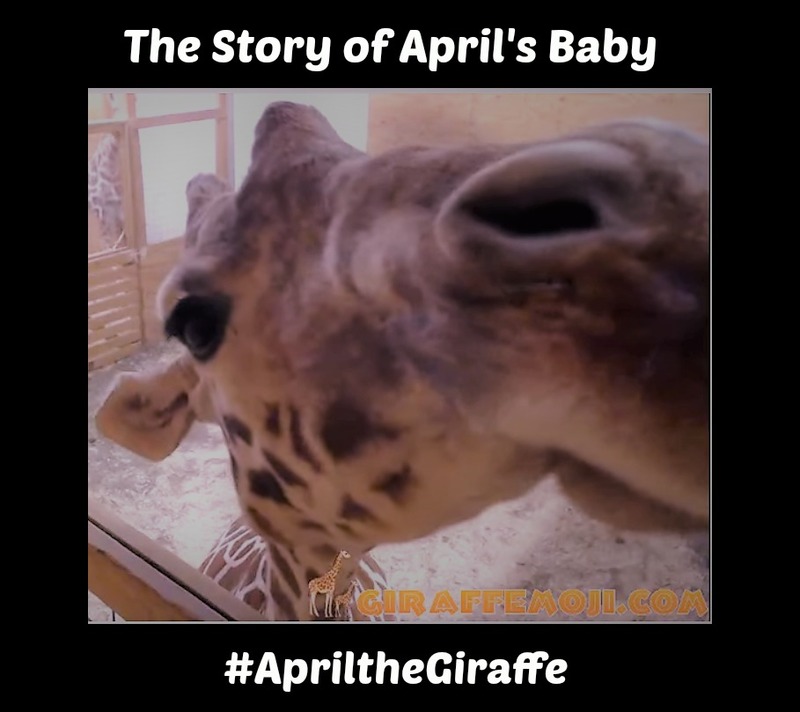 All of this means that the timing of the impending arrival is pretty vague, thus #ApriltheGiraffe Watch 2017 began to build. As the days progressed, the feed got more and more attention as people joined in, believing it couldn't be much longer. Well, they may have been a little bit wrong, but once you start watching, it's hard not to get hooked! What I've enjoyed most about this whole experience is seeing the care that goes into looking after the animals. The two keepers, Cory and Allyssa, are clearly devoted to their charges. They don't just clean up after them and make sure they have fresh food, they interact with them and show them a lot of affection. In this screen grab, Allyssa is kissing April's bump and stroking her and April loves it. You can tell how much she appreciates Allyssa, as the vet got a swift kick for his trouble when he tried to touch her! 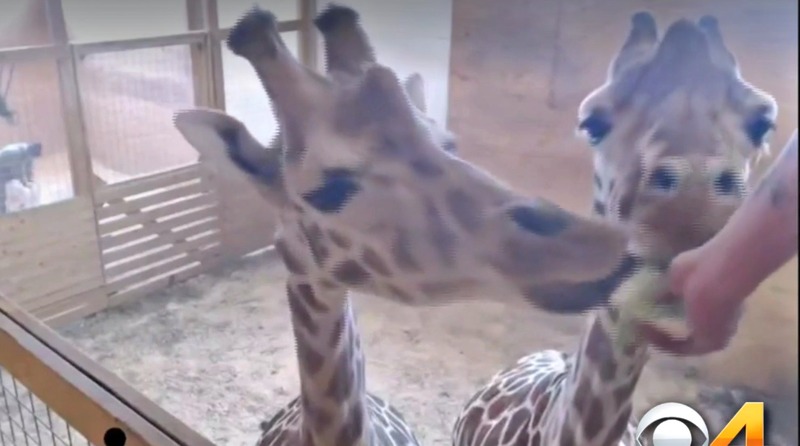 The giraffes get regular treats and it is most definitely the highlight of their day. You can see them getting excited in the build up to treat time and, in this picture, you can almost make out a smile on April's face as she reaches for some lettuce. As I write this, we are still waiting for April's baby. It's been a few weeks and she seems quite relaxed about it all. I don't mind waiting, really. I think it has given so many people a unique insight into the day to day lives of giraffes in captivity and has shown how the park goes about caring for them. In the meantime, L has made an animation showing how he thinks the April's Baby saga will end. Please give it a like if it makes you giggle, he would be really pleased. If you are a fan of giraffes, or babay animals in general, perhaps I will see you on the CBS Denver live feed soon. You can find it on their Facebook page. I can't put a direct link, as they have to do a new one every four hours!